A day trip from Marrakech to Ait Ben Haddou is a wonderful plan difficult to match. Ait Ben Haddou is a city that is always on the lists of the places that must be seen in Morocco. It was declared a World Heritage Site by Unesco in 1987. It once occupied a prominent place on the trans-Saharan trade route, being a station for caravans in the old days, where gold, silver, salt, spices and slaves were transported. Now it is one of the most famous attractions in the country. Film enthusiasts will recognize this place in many Hollywood movies as, among others: Gladiator (2000), Babel (2006) or Prince of Persia: The Sands of Time (2010). After picking up at your hotel or riad in Marrakech, we will head south until we reach the High Atlas. After a dozen kilometers, when we begin to climb the mountain range, we will see a couple of Berber villages perched in the mountains in an amazing camouflage with nature. Villagers tend to be self-sufficient, dependent on agriculture and livestock, so do not be surprised by the large number of farms seen along the way. During the trip we will cross the mountain range crossing the Tizi-N-Tichka pass, 2,260 meters high, enjoying the mountain road and its amazing landscapes. Before arriving at Ouarzazate we will stop at Ait Ben Haddou, the star stop of the tour. Ait Ben Haddou is a typical example of traditional Berber architecture. Walking through the 'streets' and below them (the kasbah) you can see what life once was like in the fortified city (also called ksar). Although the majority of the population moved from Ksar, there are still families who live and work there. 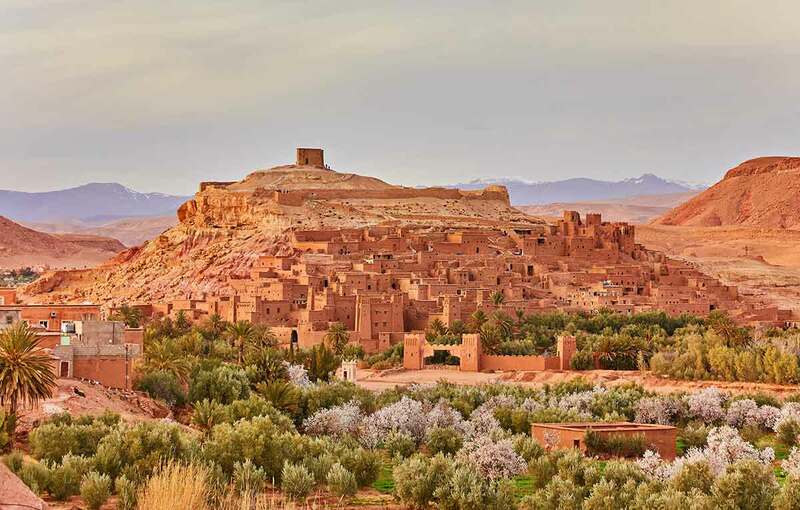 After leaving Ait Ben Haddou, we will go to Ouarzazate, a city that is 30 km from the fortified city and equally famous in the film industry, where there are two large studios and a large museum of cinematographic art. The name "Ouarzazate" is a Berber combination of two words, meaning silent and peaceful. Once in Ouarzazate you will have free time to eat, tour the city, visit the Kasbah of Taourirt, a beautiful and well preserved construction that contains many heroic stories and ancient history, or venture into the cinema museum located just in front of the kasbah to discover Why Ouarzazate is known as the "Hollywood of Africa". The trip will end here and we will take the road back to Marrakech to arrive at sunset. The driver will drop you off at your hotel or anywhere in the city. We will be back in Marrakech around 7:00 p.m.